(Allendale, Mich.) Further evidence of climate change was seen last Saturday at the NCAA Division II Women’s Championship at The Meadows GC in Allendale. 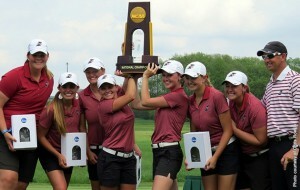 The University of Indianapolis (IN) became the first school outside of Florida to capture the national golf title beating perennial powerhouse Rollins College (FL) by five shots in the 72-hole medal play competition. It was also the school’s first national sports crown in its history. However, it was not a surprise outcome to its coach, Brent Nicoson. Leading the field by a single shot over Rollins after day one, the Greyhounds’ strong play on the second gave them a 16-shot advantage over the field. It was a lead they never relinquished in spite of a late charge by Rollins which carded a week low tally of 293 on the final day. “We held the lead for three days but we knew we could do it,” said senior Chanice Young who paced her squad by tying for fifth place in the individual competition, five shots behind medalist Brenna Moore of Midwestern State University in Wichita Falls, Texas. “Last year, we finished fifth at the finals so this year we wanted to move up the leaderboard. We felt comfortable here at The Meadows. It’s northern golf so it’s home to us.” Joining Young on the winning national team were Brooke Beegle, Annika Hayes, Paxton DeHaven and Molly Ward. Getting off to a good start in the individual competition was Moore, a Midwestern State senior who became the school’s first national champion. 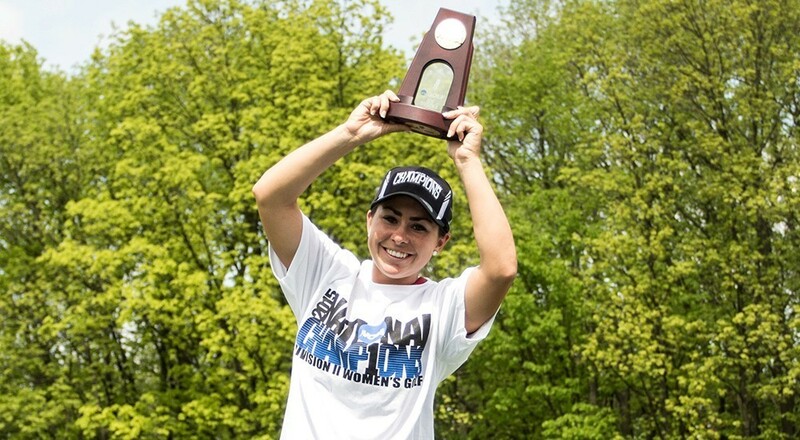 She followed up her opening 74 with steady rounds of 73, 74 and 76 to claim the medalist crown by two strokes over Rollins’ Madison Lellyo. “After the first round, I told myself to stay in the moment and if I hit a bad shot to recover and move on.” said Moore, a graduating senior who’s entering nursing school next fall.” For the week, Moore carded only two double bogies over the demanding Meadows layout, designed by Michael Hurdzan on the campus of Grand Valley State University. Competing as an individual, GVSU’s Kelly Hartigan, a senior and four-time All-GLIAC player, finished tied for ninth with rounds of 79, 80, 74 and 72.